The USDCHF continued its bearish momentum on Friday but so far still unable to move consistently below 0.9400 key support area which has been a strong support since last week. We need a consistent move below 0.9400 to continue the bearish scenario targeting 0.9300. On the upside, immediate resistance at 0.9480. Break above that area could trigger further upside pressure testing 0.9550 but as long as price stays below 0.9550 the major scenario remains to the downside. 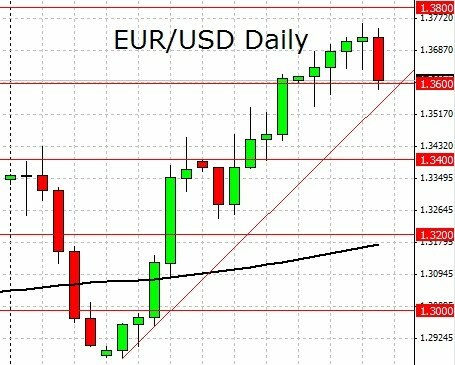 In the previous review EURUSD weekly review, we noted that from a technical point of view the currency pair remains bullish. If the 1.36 region does not hold, we may see a test of the 1.38 region. Looking at the EUR/USD chart above, we can see the currency pair falling short just below the 1.38 region. The bullish momentum for the week started right from the start. It was reported that investors were becoming confident of the Euro Zone and that the deficit crisis will come to pass. Furthermore, Germany’s pledge to do whatever it takes to support the Euro currency brought relief to many. When the UK GDP was announced, there was risk aversion. The UK GDP for the fourth quarter shrank and investors were worried about the impact it might bring to the Euro Zone Deficit Crisis. Having said so by midweek, the EURUSD turned bullish again. Comments by Mr Trichet were fueling speculations on a possible interest rate hike in the near term. Mr Trichet said that the European Central Bank will do what is needed to keep inflation in check and that it’s credibility on price stability remains. The main surprise of the week was saved for the last day. The escalating problems of Epgyt brought about risk aversion across many markets. Currencies and equities were affected. A flight to safety assets such as the US Dollar probably happened. A report came out this week regarding China’s speculative growth. It was reported that 45% of global investors who participated in a poll believed that China may experience a financial crisis within five years. It is widely believed that the current growth rate of China is too fast too furious and is hence unsustainable. It is a speculative credit driven bubble. The Chinese authorities see this too and hence the numerous actions to curb speculative growth. This is a double edged sword. While curbing speculative growth is good, investors also worry that too much curb may stall a global recovery, believed largely to be fueled by China’s spectacular growth. Equities worldwide suffered this week due to the escalating protests in Egypt. This is a reminder to us that the nature of today’s connected world means that no one major event will be an isolated incident. If the problems escalate further, we may see more risk aversion. The International Monetary Fund mentioned that the world economy in 2011 will face challenges. Unemployment and Inflation are the most crucial of them all. For those new to the class, i believe this is a big problem in the US. With unemployment close to 10%, it remains as a major drag on any economic growth. 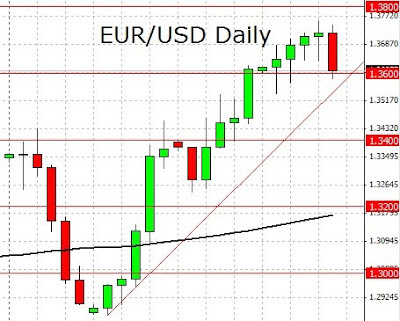 From a technical point of view, the drop on the last day of the week basically erased the bullish gain of the EUR/USD. Due to the intensity, it is probably mainly sentiment driven. Such moves are often challenging to understand and i urge all to monitor the situation of the Egypt protests. Over trading may cost you your forex margin account. If 1.36 fails, we may see 1.34. Next week is an important week. Besides the usual economic data releases, the ECB minimum bid rate and the US Non-Farm Payroll is due. You can find the list of the various economic releases in the Economic Calender below. The EURUSD was indecisive this week, made a Doji on weekly chart. Now let’s take a broader look on weekly chart below and see what kind of information we can get, at least from my subjective perspective. Price has been moving in a triangle formation, suggests a consolidation phase. No clear direction until a break above or below the triangle. From the past historical movement, we are now in a phase where 1.3500 is a key support/resistance area and a move above or below that area could determine the next direction. From this point of view, although the bullish momentum was paused this week, the fact that price still move above 1.3500 still suggest more bullish bias for now, but need a clear break above 1.3800 (March 2010, June and July 2007 high) to continue the bullish scenario testing the 1.4000 and the upper line of the triangle around 1.4200 – 1.4300. On the other hand, a consistent move back below 1.3500 next week would be a threat to the short term bullish bias as a false breakout scenario could be produced, testing 1.3250 even back below 1.3000. Of course, there is always another scenario beside bullish and bearish that we could have in weeks to come, a sideways scenario as what happened in the blue box at the chart, before made a strong break to the upside and hit 1.6038 on July 2008. Be ready to whatever happens next week and as always, trade what you see, not what you expect. The EURUSD made another indecisive movement yesterday. There are no changes in my daily technical outlook. I am still in bullish mode and just keep waiting for a minor bearish correction around 1.3625 – 1.3550 support area to go long with nearest target remains around 1.3800. On the downside, break below 1.3500 could be a threat to the bullish outlook. On the other hand, a clear break above 1.3800 would give us further validation to the bullish continuation scenario targeting 1.4000 area. The EURJPY made a significant bullish momentum yesterday, broke above 113.00, topped at 113.99 and closed at 113.72. The bias is bullish in nearest term targeting 114.90. Immediate support at 113.00 (former resistance). Break below that area could lead us to neutral zone in nearest term as direction would become unclear and activate my wait and see mode. The GBPJPY continued its bullish momentum yesterday, topped at 132.64 and closed at 131.93 but traded lower earlier today in Asian session, hit 131.24. The bias is neutral in nearest term but I still prefer a bullish scenario at this phase as long as price stays above 129.30 key support area. Immediate support at 130.40. From medium term outlook as you can see on my h4 chart below, looks like price is likely to move in wide range area between 129.30 – 134.20 in nearest future and need a clear break on either side to see clearer direction. Medium/long term bullish scenario would have further validation by a clear break above 134.20. The AUDUSD had a bearish momentum yesterday, bottomed at 0.9876 and closed at 0.9910. The bias is bearish in nearest term re-testing 0.9800 key support area but note that overall price still trapped in range area of 1.0020 – 0.9800 and I think the best intraday strategy remains to short around 1.0020 or long around 0.9800 as we have the best risk-reward ratio there. I still prefer a bearish scenario at this phase but we need a clear break from the range area to see clearer direction and might need to wait until next week to see that happen. The GBPUSD was volatile but indecisive yesterday. Price attempted to push higher but 1.6000 resistance area did a good job so far preventing further upside pressure, confirms my range/sideways intraday outlook. There are no changes in my daily technical outlook and strategies and aggressive intraday traders can short around 1.6000 or long around 1.5780/50 with tight stop loss. We need a clear break on either side to see clearer direction and might need to wait until next week to see that happen. The USDJPY had a bullish momentum yesterday, topped at 83.19 and closed at 82.83. This facts keep my bullish outlook intact since the bullish momentum triggered by a V-bottom formation as you can see on my h4 chart below still targeting 84.40 especially if price able to make a clear break above 83.20. However note that actually we haven’t seen consistent momentum in the last three weeks with three Dojis on weekly chart. I still prefer a bullish scenario. Aggressive intraday traders can long around 82.33 with stop loss below 81.80 while conservative traders can long around 81.80 with smaller stop loss with the same bullish target around 84.40. The USDCHF failed to continue its bearish momentum yesterday, topped at 0.9480 and closed at 0.9458. The bias is neutral in nearest term, but as long as price stays below 0.9550 I still prefer a bearish scenario at this phase. On the downside, another move below 0.9400 would keep the bearish outlook remains strong still targeting 0.9300.